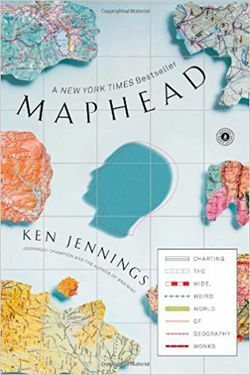 Author Ken Jennings, the noted Jeopardy winner, writes in a lighthearted yet serious vein about maps and geography. He recounts the considerable influence of Rand McNally on the systemizing and labeling of U.S. Roads. He writes of people who steal maps from library collections, of people who have become obsessed with the game aspect of geocaching, of people like David Rumsey who is digitizing his huge private map collection and is uploading it for public usage. There are stories of people whose family history can be traced on a regional US map of geocachers, even maps drawn by his son to “X” marks the spot. It is a relaxing introduction to the world of geography and maps.